so please see here for a complete list of distributors. Well produced and suitable for a wide range of subjects. Well-produced decals suitable for many aircraft types. Recommended to those wishing to model post-WW2 Yugoslav Air Force subjects in 1/144. I think that Balkan Models are a Slovenian company. It is clear from their web-site that their niche is the Yugoslav Air Force that was, and air forces of the states deriving from the former Yugoslavia. Here’s what they have to say about themselves: “We produce decals and resin model kits for scale modellers around the world. Our main goal is to aware public about military history of the Balkans through world of scale modelling." The decals reviewed here are their first in 1/144-scale for which there seems to be an ever-growing range of kits, many with surprisingly good detail and finesse despite their small size. The set covers the period from 1955 until the breakup of Yugoslavia. It was in 1955 when the Yugoslav Air Force formalised and standardised markings for all military aircraft. Three roundel sizes are covered (500, 750 and 1000-mm) and two sizes of fin flash or flags (450 and 950mm). Also included are large and small code numbers in black and white. There are enough markings to decal nine different aircraft. 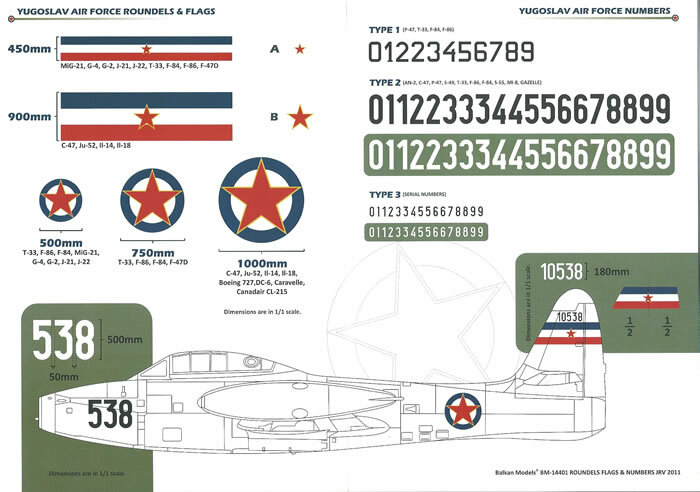 The decals could be used for many types including the Mig-21, G-4, G-2, J-21, J-22, T-33, F-84, F-86, P-47D, C-4, Ju-52, Il-14, Il-18, 727, DC-6, Caravelle, Cl-215 and several others. The decals appear to be very well produced, with good registration and colour density. When I have previously reviewed BM’s product there was no pricing or distribution information. So I’m pleased to see now that they have established a distribution network from west from Balkans to the UK, and north to Russia, and as you would expect these distributors provide pricing information. The appeal of these decals will clearly lie with the limited niche market of Yugoslav Air Force enthusiasts they are intended for. 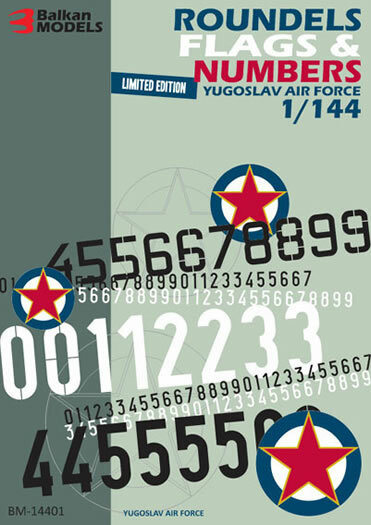 This said, there is a great range of aircraft that can wear these markings from both Western and Soviet sources, as well as some allied and axis types from WW2, so be aware that the Yugoslav Air Force has a lot to offer modeling a wide variety of aircraft types is your thing. The sheet is nicely produced and looks to be good quality. I highly recommend these decals to those who wish to build Yugoslav subjects in 1/144-scale.